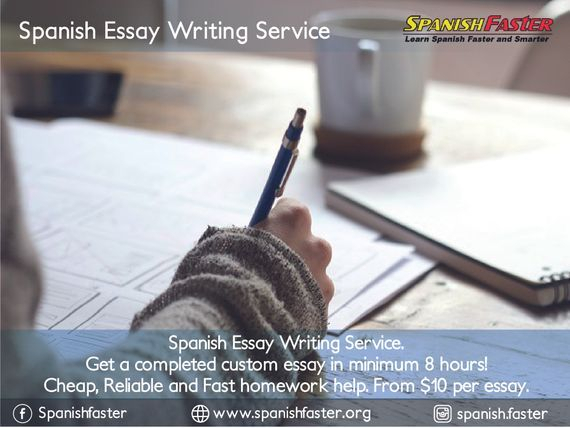 Spanish Essay Writing Service. Hire a Spanish essay writer online to write your essay from scratch. Buy a Spanish essay online now! Cheap, Reliable and Fast homework help. From $10 per essay. Do you need help with your Spanish homework? Are you struggling to turn in a Spanish essay on short notice? Try our Spanish Essay writing service. Our Spanish essay writers can help to write, edit, proofread, correct or mark your essay. Get a completed custom essay in minimum 8 hours! We offer a professional Spanish essay writing service. Our Spanish essay writers are qualified teachers with a lot of experience tutoring students all over the world and preparing them for various examinations. They know exactly what a teacher or an examiner would expect from a student. Our Spanish essay writers can also write at your level, or for the level required, as per your needs. So when you hire a Spanish essay writer from Spanish Faster, you have the guarantee you'll get exactly what you needed. Can someone write my Spanish essay for me? I don't know how to write my Spanish essay. I need help to write my Spanish essay. I have no time to write my Spanish essay. I need someone who can write my Spanish essay for me. from desperate students in need of a Spanish essay writer. If you're looking for someone to write your essay, you have come to the right place! Our team can help you write that Spanish essay for your school homework. Why choose our Spanish essay writing service? Our writers are also Spanish teachers. They know what is good writing. They are flexible and can adapt to reflect your voice and proficiency! We work 24/7 to ensure to deliver your essay on or before the set deadline. We are never late! We provide custom Spanish essays that are plagiarism-free, 100% original. We check every assignment we complete for similarity! No one will know you have ordered your Spanish essay from us. Your essay is written just for you. We do not resell it to others! We offer very reasonable, if not cheap, prices for our service. You get real value for money for our Spanish writing service! With Spanish Faster, it is very easy to hire a Spanish essay writer online. Just follow the 4 steps outlined below. Step 1: You fill our Order Form and send us the essay question. 1. Send us the essay question and the exact requirements. What is your course name? What is number of words required? You can give us a range. What is the level the essay needs to be: Beginner? Intermediate? Advanced? Give us any other information that you think will help us. 2. Tell us your deadline. Step 2: We send you a Quote. 1. We look at your requirement and we give you a Quote. 2. We send you a Secured Link for Payment via Paypal or Credit Card. Step 3: You make Payment. We start writing. 3. Once we receive your Payment, we will assign the write-up to one of our tutors. 4. After we receive the essay, our Revisor will review it and make any changes, if needed. Step 4: We send you the final essay. 5. We send you the final essay before your Deadline. 6. If you wish to make some changes, we offer free revisions within 5 days after delivery. Note: For payment using Paypal or Credit Card, there is an extra 5.2% charge on the fees above. This 5.2% is what is charged by Paypal and Credit Card companies as THEIR service fees, so WE do not cash this extra amount. All prices quoted above are in USD. 1. Who will write my essay? Your essay will be assigned to a subject matter expert, NOT any random writer. For example, if you need to write an IGCSE Spanish essay, we will assign a very experienced IGCSE Spanish tutor to write the essay. 2. Can I request for the same writer for my next assignment? Yes, if you have a preference for a specific writer, we can always assign that writer for your assignments. 3. Can I request for some changes after I receive my essay? Yes, you can do that. We provide a 5-day free revision period after delivery of the essay. When requesting for changes, please give us your comments and full details of what to change. 4. Will I get a discount if I have many essays to write? Yes, we definitely have discounts for large volumes. Let us know the details and we can give you a Quote. 5. Will you sell my Spanish essay to other students? Absolutely not. Your essay is written just for you. We do not resell any custom essays to others.